What Terrain is Most Suitable for the Formation of Wave Lift? Steep downwind slopes work best. E.g., the famous Sierra Nevada wave is triggered by the steep downwind slopes on its eastern edge. Similarly, the wave of the Rocky Mountains near Boulder, CO is triggered by the steep eastern slopes along the Front Range. The height of the terrain on the downwind side impacts the amplitude of the wave but not its wavelength. Waves can only form if the air is stable, i.e., if the Environmental Lapse Rate (ELR) is less than the Dry Adiabatic Lapse Rate (DALR). (Remember that the DALR is always 3 degrees Celsius per 1000 ft of altitude.) This is fairly obvious: waves can only form if displaced air has an inherent tendency to return to the altitude from which it was displaced. That is only the case if the air that was forced down along a slope will be (significantly) warmer than the surrounding air at the lower altitude. The more stable the air is, the bigger the temperature difference between the displaced air and the surrounding air mass will be, and, therefore, the greater its tendency to “bounce back” to the level from where it was displaced. What’s the Role of the Wind and the Wind Profile? Ideal wave conditions are typically found if the wind above ridge level gradually increases with altitude (and if its direction remains more or less constant, ideally perpendicular to the downward slope.) The increase in strength tends to propagate a longer wave train with multiple oscillations of the air behind the primary wave. If the wind decreases with altitude, strong lift may still be found in the primary wave, but the wave train will be short. If the decrease with altitude is rapid, the upward flow in the primary may become almost vertical, producing very strong lift – but only up to a point: the vertical flow can obviously not continue for long, and where it stops, the wave will “break”. If this happens, the smooth upward flow can suddenly become extremely turbulent – a frequent reason for pilot reports of “clear-air-turbulence”. What if the Wind is Blowing at an Acute Angle? Ideally the wind at ridge level and above is blowing directly perpendicular to the trigger. If the terrain is irregularly shaped, remember that it is always the downward slope that counts. If the wind hits the downward slope at an acute angle, the wave will likely be distorted and some anomalies will pose additional challenges. First, the wave will likely be broken up into patches. The ridge is rarely a straight line. Sections of the ridge where the angle to the wind is close to 90 degrees will trigger a strong wave response, while those where the angle is very small may trigger no wave response at all. According to G Dale (The Soaring Engine, vol two, p92), even smooth ridges do not produce a regular wave if the angle is very acute. Especially the downwind wave bars will be broken up and distorted. Such patchy wave systems can be turbulent and hard to read. Second, the area(s) of lift are likely to appear closer to the ridge than when the wind is hitting the ridge perpendicularly (all else being equal). If you fly within an area of lift, the nearest section of the ridge will indeed be closer. However, if you look directly into the wind (and not just at the section of the ridge nearest to you), you’ll notice that the section of the ridge that triggered the wave will be farther away. Third, if you fly along an area of wave lift triggered by wind hitting a ridge diagonally, the headwind/tailwind component will be very different depending on which direction you are traveling in. This means that you will move much faster in one direction than in the other, and the necessary crab angle to stay in wave lift will also be very different. What if there is Wind Shear Above the Ridge? A “good” wave requires that the wind direction above the ridge remains more or less constant. If there is significant shear aloft the wave pattern will get distorted and if the shear is strong enough the wave becomes very difficult to read. There may still be spots where the distorted streamlines are “in phase” and where there is strong lift; however, finding these spots can be very difficult, especially if they are not clearly marked by clouds. Remember that the wavelength is the (horizontal) distance between the top of the wave crest and the top of the adjacent wave crest. The wavelength is determined by the strength of the wind and the stability profile of the air. … the stronger the wind. This makes intuitive sense because the air will travel farther between two oscillations if the wind is strong. … the less stable the air. This also makes sense: if the air is very stable the wavelength will be short: it will not be displaced as much from the midpoint, and it will have a stronger impetus to quickly return to it. Mountain waves tend to have a wavelength anywhere between 3 and 30 kilometers. Note that short wavelengths tend to produce better climb rates than long wavelengths because the angle at which air flows up and down along the streamlines is necessarily steeper if the wave length is shorter. Remember that the amplitude is the height of the wave measured from its midpoint to the top of the wave. The amplitude depends on the topography, the strength of the wind, and the stability profile of the air. … the higher and steeper the trigger slope. Height is the most obvious factor because it determines the maximum extent to which the air can get displaced. A steeper slope results in a greater amplitude because the air is displaced faster and farther than along a shallow slope. That means that the temperature differential to the surrounding air will be greater, the bounce-back will be more vigorous, and therefore the air’s tendency to overshoot the bounce-back will be greater as well. … the stronger the wind. A strong wind will have more power to displace the air farther along the slope. The farther the displacement, the stronger the bounce-back, and the greater the overshoot. Note, however, that this does not necessarily mean better climb rates! A stronger wind will also increase the wavelength; therefore, the angle at which the air rises back up will be shallower than in a weaker wind where the wavelength is shorter and therefore the angle is steeper. … the more stable the air. A very stable air mass will be very “bouncy” because any displacement from the original level will result in a high temperature differential from the surrounding air, prompting a vigorous return towards the initial level, thereby building up a strong momentum / inertia leading to overshooting. Note, however, that the level of overshooting will also be limited by strong stability. So the amplitude is likely to be biggest if the stability is very strong at altitudes below the ridge and less strong at altitudes above the ridge. What Wavelength and Amplitude Generates the Best Lift? The strongest lift for soaring will occur when the wave length is short and the amplitude is very high. Moderately strong winds moving a very stable air mass directly across a high mountain range along a steep downward slope will generate such strong conditions. How Do Multiple Ridges / Mountain Ranges Affect the Wave? A second ridge downwind of the wave trigger will interfere with the wave system generated by the first ridge. The nature of this interference can be constructive or destructive. It will be constructive if the second ridge is located “in phase” with the wavelength triggered by the first ridge: in this case the amplitude of the wave will be increased by the second ridge (while the wave length will likely remain unchanged). Ridges are usually not exactly parallel to one another; i.e., the distance between the first and the second ridge will not be constant. Hence, the second ridge can be constructive along one section and destructive along another section. The possibilities of wave interference in typical complex terrain are endless. Can Single Peaks Trigger Wave? Like water flowing along a stream, wind blowing across terrain will always seek the path of least resistance. That means that the wind will tend to flow around single peaks and not directly over them. However, the wind flow will still be disrupted and some wave can be formed. 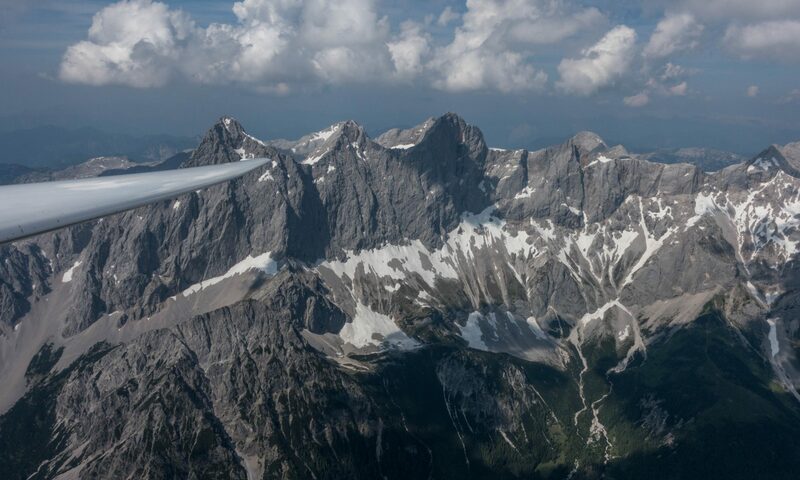 According to R. Hertenstein (Riding on Air, p 57), the wave flow behind a single peak resembles the wake left by a ship plowing through water with a wave response downwind on either side of the mountain. This wave will tend to be relatively weak and not extend far above the top of the mountain. How Do Isolated Peaks Along a Mountain Range Impact Wave (e.g. Longs Peak, Mount Evans)? Often there are isolated peaks that are set off and stand tall above a long mountain range. Longs Peak, somewhat offset from the Continental Divide along the Front Range of the Rocky Mountains in Colorado is such an example (see image). In this scenario the smooth wave lift in the lee of the Rocky Mountains may be interrupted by turbulence and sink. According to experienced local pilots it is often impossible (on pure wave days) to bypass such a peak and still connect with the lift on the other side. Longs Peak (14,259 ft) is a great example for a prominent isolated peak along a mountain chain. The ridge line of the Continental Divide to the North and South of Longs Peak is approx. five miles further to the West and approx. 1,500 ft lower. On other days, when the wind blows at an acute angle against the mountain range, it is possible that such an isolated peak generates a wave response while the rest of the mountain range does not. How Strong Can Lift and Sink Be? What Determines Its Strength? Wave lift is the most powerful form of lift that can be used for soaring. 1,000 feet per minute (5 m/s) is considered common. On a strong wave day, climb rates can easily exceed 2,000 feet per minute (10 m/s) and sometimes reach 3,000 feet per minute (15 m/s). Sink rates on the downwind side can be equally formidable. Normally (but not always) the strongest climb rates can be found in the primary wave with rates diminishing in the secondary and tertiary. The strength of the lift is a function of the wavelength, the amplitude, and of the position of the glider in the wave. … the wave length is short. A long wavelength stretches the wave such that the angle of the rising air will be relatively shallow. In addition, a long wavelength is typically also associated with very strong winds. That means that moving along the wave bar could be nearly impossible because most (or even all) of the glider’s forward motion may be needed to stay in the area of lift (i.e. prevent the glider from drifting out of the lift on the downwind side). … the amplitude is high. As we have seen, a high amplitude will result when strong winds push a very stable air mass down a high and steep mountain slope. How Does Wave Lift Change Throughout the Day? Unlike thermals, which depend on the sun heating the ground, and the ground heating the air, wave lift is not subject to a typical daily pattern (although thermals can and do interfere with wave – this is covered in a separate section). That does not mean at all that the wave system will remain consistent throughout the day. Since for any given terrain, wave is primarily dependent on the wind and the stability profile of the air, changes to either one will alter the wave system. This can happen gradually over several hours, or it can happen within a matter of minutes. What causes these changes is usually nowhere near as obvious as changes to thermal conditions. Why Does the Wind on the Ground Often Change During a Wave Day? In Boulder we have the curious phenomenon that on good wave days the air is perfectly still in the morning even though the wind is howling at altitude. Then, at some point during the day, the wind direction on the ground switches to west, the wind speed picks up, and the air near the ground becomes increasingly gusty and turbulent. I believe the core reason for this phenomenon is the fact that the air near the ground cools off during the night (especially on long winter nights when wave is most prevalent), building a powerful inversion layer: in the morning the air on the ground is much cooler than the air 1,000-2,000 feet above. Because colder air is heavier it stays near the ground and cannot mix with the westerly winds above. Over the course of the day, the ground inversion gradually dissolves as the layers near the ground are warmed from below after several hours of sunshine hitting the ground. Once the inversion has dissolved, it no longer forms a protective barrier. The westerly airflow and the associated rotor turbulence can now reach all the way to the ground. That means that suddenly it becomes windy at the airfield. The general direction of the wind will be in line with the wind at altitude (in Boulder that is westerly) but wind speeds and directions can fluctuate significantly due to rotor turbulence. What Can Destroy Wave Lift? Just like wave lift can change throughout the day due to changes in the wind and the stability profile, it can also end gradually or even suddenly. E.g., imagine you are flying in wave downstream of a “second ridge”, which amplified a wave system originally triggered by an upwind ridge. It would only take a relatively small change in the wind speed (increase or decrease) to change the wavelength and could mean that the second ridge becomes “out of phase” with the wavelength of the system. As the second ridge flips from being constructive to being destructive the entire lift would break down rather quickly.